2 a.m. Tuesday: UPDATE: All clear. One work vehicle under the Brooklyn Bridge, but traffic is moving well on the BQE. 10:30 p.m. Avoid the BQE near Cadman Plaza West exit and near the Manhattan Bridge as two different accidents are screwing traffic up. FDNY and NYPD are responding to the scene at this moment. The weather forecast for this Saturday’s Eileen Dugan Memorial 5K Run in Brooklyn Bridge Park is partly cloudy with a temperature in the upper 50’s—a perfect day for running. 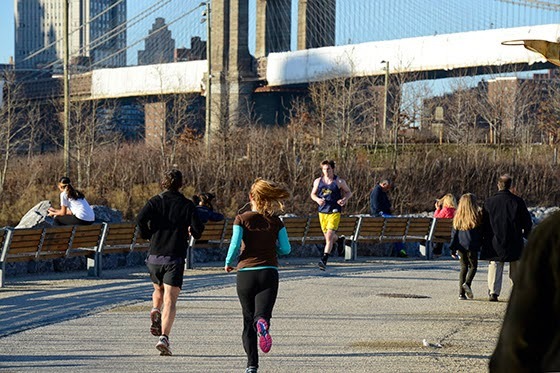 The Run is a scenic 5K route (3.1 miles) spanning Brooklyn Bridge Park with breathtaking views of the Brooklyn and Manhattan Bridges, the Manhattan skyline, and the NYC harbor. Start and Finish at Pier 6. According to a friend of missing designer James "Jay" Ott, the NYPD found new surveillance footage showing Ott walking over the Williamsburg Bridge towards Manhattan at 5:02 a.m. on Sunday morning, Match 23. 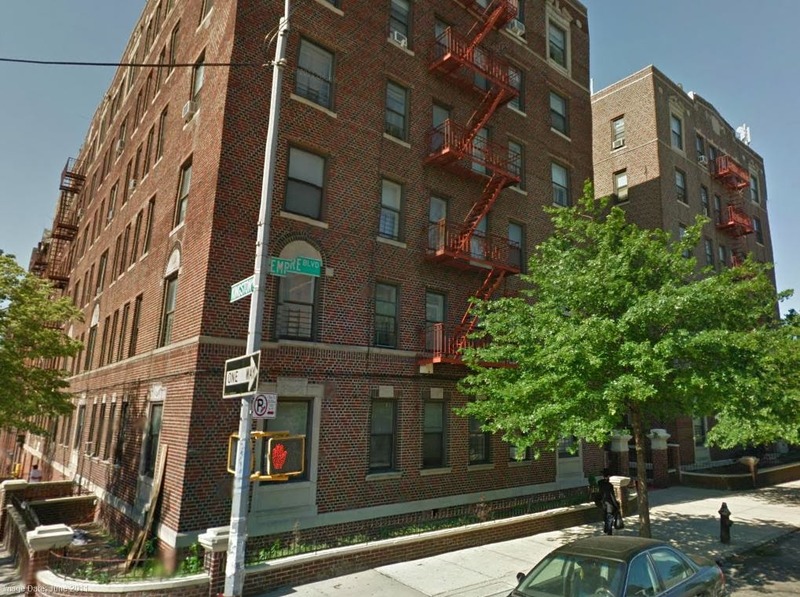 The Brooklyn Eagle has more on this development. A mysterious, imposing castle-like fortress is perched on an island in the middle of the Hudson River near West Point. On Saturday, April 12, from 1:00pm to 3:00pm, Green-Wood Cemetery in Brooklyn will host Wes and Barbara Gottlock, authors of the book Bannerman Castle (available for purchase and signing) and official Bannerman tour guides, as they detail the history of this remarkable site which includes Green-Wood ‘permanent resident,’ Francis Bannerman. After the presentation, a brief tour of the cemetery will take place aboard the Green-Wood Trolley including a stop at the Bannerman family plot. The talk is free. The trolley tour is $20; $15 for members of the Green-Wood Historic Fund and the Brooklyn Historical Society. Reservations recommended. For more information or reservations, call 718-210-3080 or visit www.green-wood.com/toursevents. In years past, traffic deaths were seen as inevitable in NYC. Mayor de Blasio hopes to change that scenario. His plan to reduce fatal traffic and pedestrian accidents -- Vision Zero --will be discussed at a town hall Tuesday night at Brooklyn Borough Hall from 7 - 9 p.m. 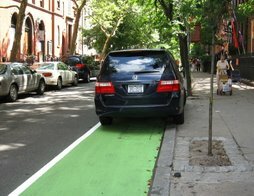 The NYC Department of Transportation (DOT), City Council Speaker Melissa Mark-Viverito, and other officials will discuss the program and get input from residents. Transportation Commissioner Polly Trottenberg said last week that Brooklyn’s Atlantic Avenue would be one of the program’s first priorities. Full details at the Brooklyn Eagle. 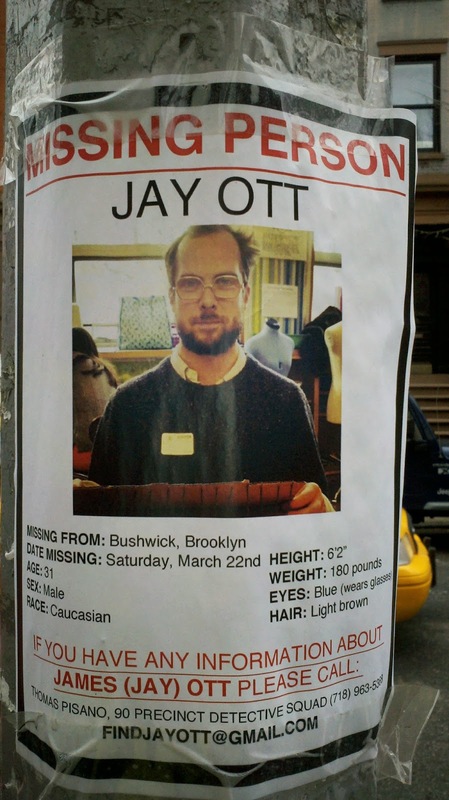 Police and friends are still searching for James "Jay" Ott, last seen by his friends on Saturday, March 22. He was last spotted by a surveillance camera outside a bodega near his home in the McKibbin Lofts in Bushwick just before 5 a.m. the next day, wearing a blue cap. Mr. Ott is about 6 feet 2 inches tall, weighs 180 pounds, has light brown hair and blue eyes and usually wears glasses. Anyone with information about him is asked to call Detective Thomas Pisano of the 90th Precinct Detective Squad at 1-718-963-5368, or email findjayott@gmail.com. At The Dock Group, Ott serves as design director for Crippen and Rosetta Getty, who is launching a signature ready-to-wear collection this fall, according to WWD. In case you missed the video of cops arresting teens in Downtown Brooklyn after allegedly pushing one through a Chinese restaurant front window, here it is. The fracas was said to have started with two girls refusing to leave the restaurant when asked by the owner. Witnesses say about 100 teens gathered on Jay Street. 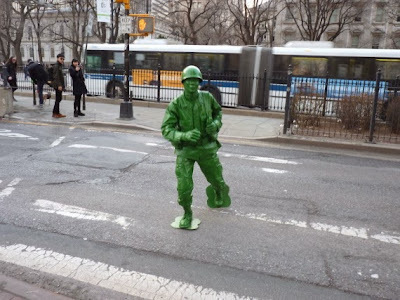 Gothamist has the roundup of the happening. Brooklyn Eagle: After attorneys for LICH supporters raised hell on Wednesday about alleged interference by SUNY and the state Department of Health in the voting process, the deadline to evaluate the nine LICH bids was extended to give panelists a chance to reconsider the proposals. The panelists have been instructed to “disregard any information conveyed to them" by SUNY during an unmonitored conference call. The new deadline is Monday, March 31 at 5 p.m. Nothing like a little "interference" by the state into what was supposed to be a clean process. Thank goodness for the level-headed judgement of state Supreme Court Justice Johnny Lee Baynes. This is a gigantic case that will eventually end up in legal school text books. Did you know that women only started working in the NYC Department of Sanitation in 1986, and even now, out of 7,000 workers, only 200 women work in the department? Another interesting factoid: "Employee schedules and waste removal measurements are still written by hand in a book." More about New York's trashy history here. 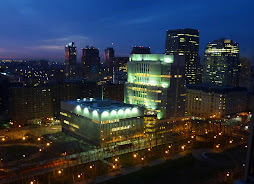 After a year-long legal battle where SUNY dragged its name through the mud, it almost appeared that they were going to follow the rules of their hard fought agreement to let the friggin' Long Island College Hospital (LICH) RFP process proceed unhampered. Of the the nine different plans, four bidders submitted proposals to operate LICH as a full-service hospital. Amazingly, now it turns out that SUNY held an unmonitored conference call with the sequestered panelists/ evaluators a day and a half before votes were due. In this unmonitored call, it is now alleged that SUNY misled panelists about an item of substantive importance to the vote. "Specifically, we understand that SUNY and DOH may have provided guidance to the Technical Committee that may have influenced its members to give a lower rating to the full-service hospital Offerors, based on a claim that these proposals could not secure regulatory authority to take over operations at LICH." SUNY denies impropriety, in another letter printed in the Eagle. They say they were merely assisting the panelists in understanding the proposals. “To assist the evaluators in understanding the proposals, SUNY offered to provide an opportunity for a discussion with a representative from the NYSDOH on Monday, March 24, 2014 on Article 28 hospital regulations." The idea that SUNY and DOH, defendants in multiple lawsuits over LICH, could think they could have a private conversation with the LICH panelists about ANYTHING right before the vote is absolutely mindblowing. THE MOST IMPORTANT signed document from the entire history of the #Brooklyn LA #Dodgers will soon hit auction block for the 1st time ever. Can anyone please tell us what the item referred to in the above tweet is??? Hear about what has been proposed by six nine different teams bidding to buy Long Island College Hospital (LICH). Four bidders are proposing to operate LICH as a full service hospital. Summaries of the nine proposals are here. 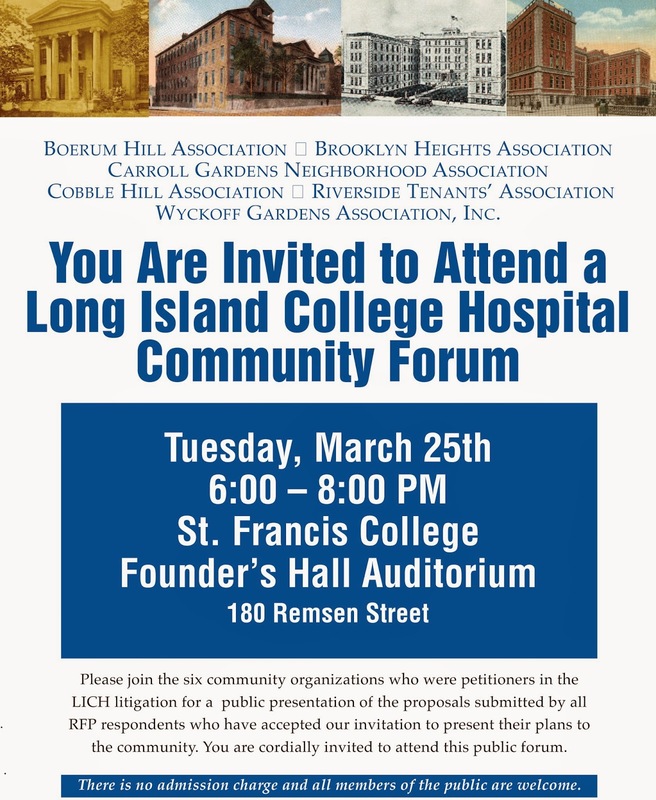 The forum takes place on Tuesday, March 25 from 6 - 8 p.m. at St. Francis College in Brooklyn Heights. The proposals will be scored based on how well they obey the guidelines set down in SUNY's revised RFP. This RFP gives extra points for a full-service hospital, with ER, ICU, affiliation with a teaching hospital, and quick transition, among other things. The RFP panels -- SUNY's and the people's representatives -- are both turning in their decisions on Wednesday. Listen to the proposals and see which one you think should be your new hospital operator. 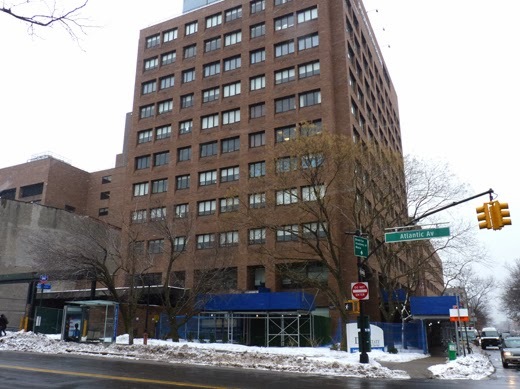 They said that nobody wanted Long Island College Hospital (LICH) in Cobble Hill, so might as well close it up and sell it's real estate to developers. But after countless marches, letters, petitions and lawsuits by very persistent residents, local officials and unions, SUNY agreed to redesign their Request for Proposals (RFP) with community input, awarding more points for a full service hospital. Lo and behold: Nine suitors want to put the glass slipper on LICH's dainty little foot -- and four of them are offering a full service hospital as part of their proposal! Last October, then-Mayor Bloomberg attributed the early losses suffered by his Citi Bike program to the costs of getting the system up and running. Now that Bloomberg is gone, the Wall Street Journal reports that Citi Bike is broke and its leaders are trying to raise tens of millions of dollars to rescue the program. The WSJ analyzes what went wrong and it's a lot: computer glitches, inability to get the bikes where they need to be, the necessity to load new batteries into the charging stations, layoffs cutting into customer service, lack of secondary sponsors, and more. And another thing: tourists -- who would pay the big bucks for the day passes -- aren't using the bikes as much as the city thought they would. And when they do, the kiosks frequently won't accept payment. Business Mayor: What happened to the business plan? 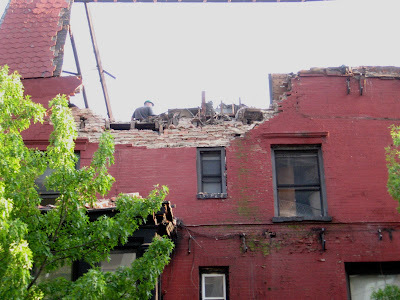 Remember when 100 Clark Street at the corner of Monroe Place in Brooklyn Heights started falling apart? (That was in 2008.) The city was going to knock the whole thing down but owner Penson Corp. went to court to force the city to stop the wrecking ball. 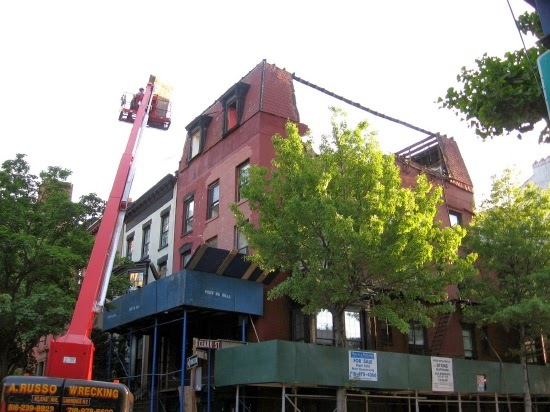 Now it's a half-demolished wreck -- but the Brooklyn Eagle reports that Developer Newcastle Realty Services is planning to restore 100 Clark St.to its pre- and post-Civil War glory. The striking mansard roof will be meticulously recreated, drawings show. While JCPenny is closing 33 of its 1,100 stores, in Brooklyn, a new Penny's is going up in East Flatbush, as the anchor of the Gateway II development. 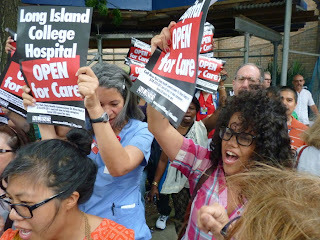 After a year of marching, letter-writing, rallying in the snow, traveling to Albany and going to court, Long Island College Hospital (LICH) supporters can finally say: "This is it!" Bids for LICH are due at 3p.m. today. 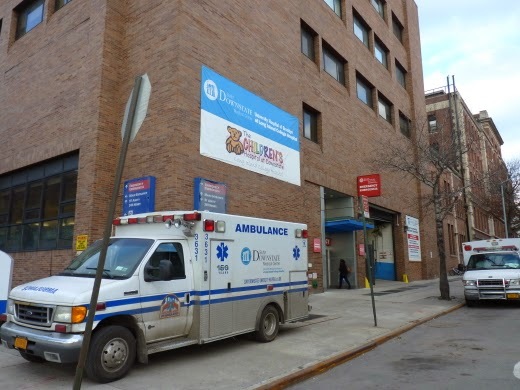 Some positive reports have been coming in from groups who have heard proposals from teams offering a full service hospital at the site of LICH, in Cobble Hill, Brooklyn. A public forum will be held soon. * The NY Times reports that developer Fortis Property screwed up a previous hospital deal in New Jersey. * Capital NY wonders if there will be a proposal that splits the community representatives, who have 49 percent of the vote, from the SUNY officials, who have 51 percent of the vote. 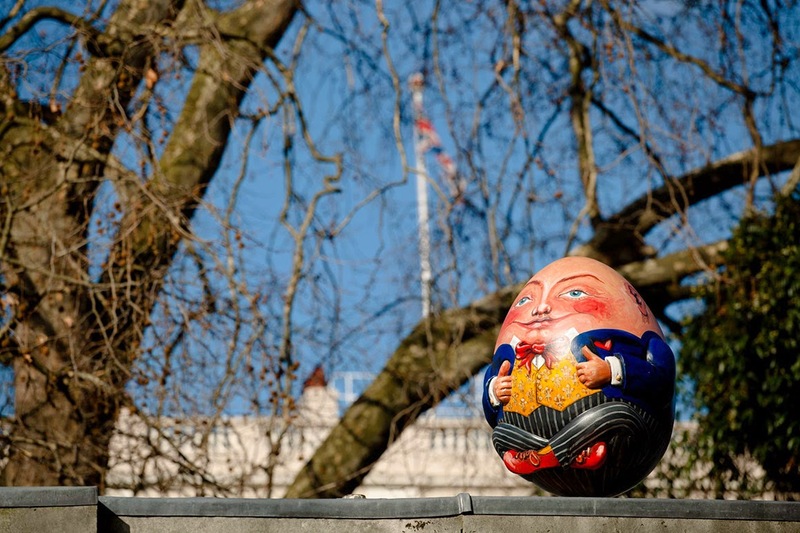 This spring, New York City will host over 200 two-and-a-half-foot tall egg sculptures for The Big Fabergé Egg Hunt. The eggs will be ‘hidden’ in public places across all five boroughs, with a fairy tale taking hunters on a journey (with their cell phones) to find them. Sponsored by Fabergé, the event will raise money for children in New York City through Studio in a School , and for endangered Asian elephants through Elephant Family. 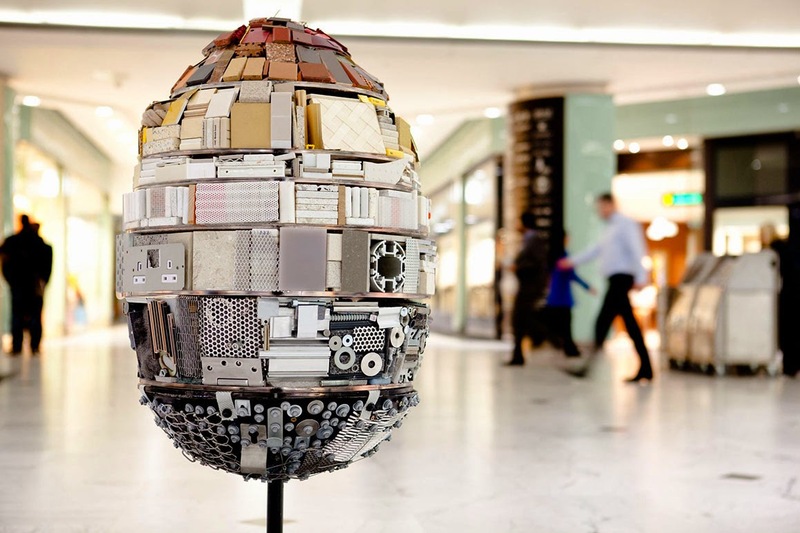 The eggs have been created by artists, designers or artsy creatives like Jacques Torres, Diane von Furstenberg, Ronnie Wood, Jeff Koons, Brooklyn Design & Fabrication Inc, Patti Smith, Marc Quinn, Bruce Weber, Peter Max, Zaha Hadid, Peter Beard, Carolina Herrera, William Wegman and hundreds more. In partnership with Sotheby’s, the sculptures will be auctioned at the end of the event for charity. While taking a walk down Atlantic Avenue in Downtown Brooklyn Monday, we couldn't help but admire the artistry of the piles of handcrafted wooden stuff in the window of Lorenzo Woodworks, 337 Atlantic Ave. This woodworking shop has been on Atlantic Avenue for 30 years. When we got home, we remembered that back in 2008, we wrote about one of the most beautiful wooden garbage bins we'd ever seen. Looking back at that post, we were reminded that commenters told us it was made by Sal, of Lorenzo Woodworks. 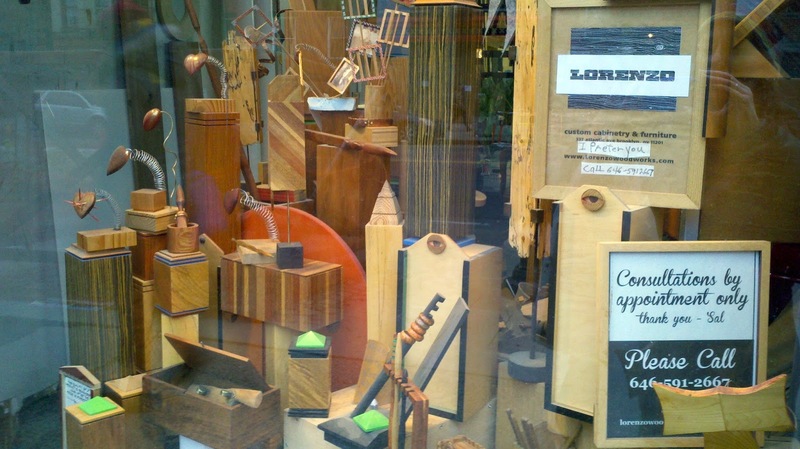 If you get a chance, check out the woodcrafts in the shop window. Even if you're a heath buff, it's pretty hard to resist walking into a store filled with magical piles of sugar. 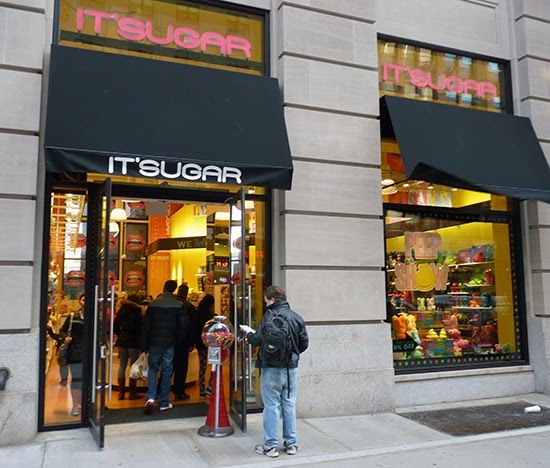 Passers-by were literally gasping, "Sugar!" when they saw the colorful storefront. We walked out with a bag of soft sugary wormy things, something purple that exploded in our mouth, and a lolly pop with a real scorpion embedded inside. Pie Chart: What % of LICH Would Be Medical Services, vs. What % Developed, Under Related /Brooklyn Hospital Plan? Dr. Becker, CEO of Brooklyn Hospital has been trying to sell a proposal that would close LICH, a competitor to Brooklyn Hospital. At meetings in Red Hook and Carroll Gardens, Dr. Becker refused to say what percentage of LICH's square feet would be dedicated to medical services vs what percentage would be developed by the Related Companies. SUNY, which owns LICH, put square footage information in their reissued Request for Proposals (RFP). 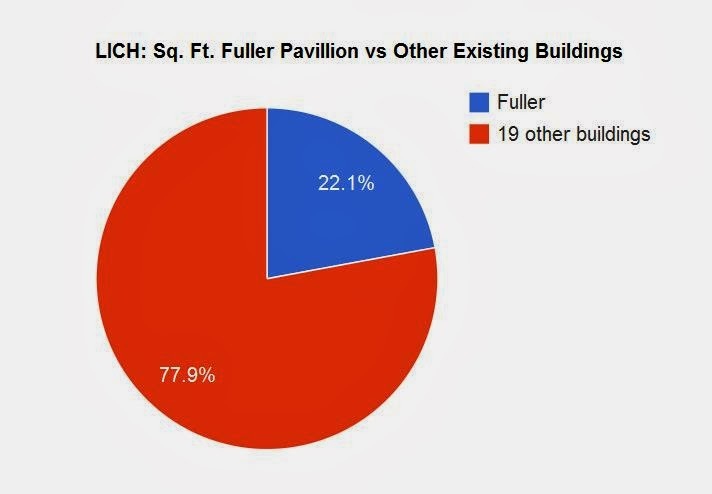 Based on this and Dr. Becker's Carroll Gardens presentation -- where he said the health-related services would all be in the Fuller Pavilion -- we came up with the following pie charts. This is a starting point. 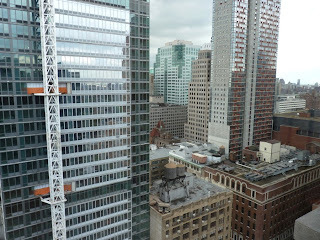 Now we have to factor in that Related Cos. wants to knock down the buildings and redevelop them. There is undeveloped property surrounding the existing buildings that could be built on, and other factors like air rights. 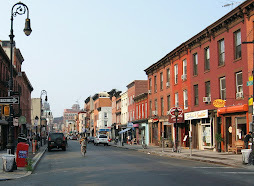 Related would also like to rezone this section of Cobble Hill so it can build even bigger. So let's factor in a bit of knock down and rebuild. This probably overestimates the amount of space devoted to medical purposes (since every time we've heard this proposal the number of ER bays and locations change). But at least it's a pretty pie chart. Two other developers are submitting similar plans. There are six proposals in the works. Three of them DO propose full service hospitals at LICH. Brooklyn: 1590 East NY Ave crime scene being established in regards to a male shot, EMS requested on a rush. Slain Brooklyn landlord (called a "slumlord" by many) Menachem Stark won $18,000 Wednesday night from a charity raffle he entered before his death, JP Updates and The Daily News reports. The debt-ridden landlord spent $100 to buy 100 raffle tickets from his nephew for a charity run by a Hasidic sect. The popular, raucous Purim party at hip Crown Heights synagogue Chevra Ahavas Yisroel is no more. Crown Heights Info reports that the congregation’s rabbi, Yechezkel Denebeim, 28, "abruptly canceled the March 15 bash" after he experienced an “awakening” during a recent trip to Israel. 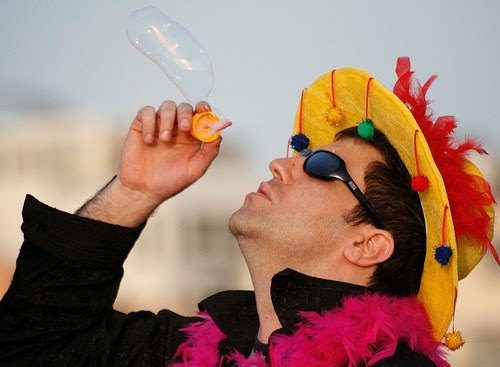 "Instead of cramming up to 600 people into the congregation’s Albany Avenue synagogue–where liquor flowed and there was masked dancing–the congregation’s Purim celebration should be more a 'meaningful, Torah-infused' affair, Rabbi Denebeim wrote to members in a Feb. 14 email." According to BJL, the congregation’s Purim party was one of the most popular in Brooklyn for young Jews. This Saturday’s party going to mimic Comic Con, with members dressed in costumes such as Batman. "Come for the lavish feast, come for the spectacular music, come for the profound Torah, and for the fundamentalists among us, come for the strong drink." The National Weather Service is warning of rapidly falling temperatures resulting in flash freezing of standing water, and strong winds (25 - 35 mph with gusts up to 50 mph) from 2 a.m. through 6 p.m. Thursday. The agency says watch out for downed tree limbs and scattered power outages, as temperatures fall into the 20s. Drivers of "high profile vehicles" may be buffeted by the wind, so exercise caution on the roads. It's not a complete story, however, so be prepared to have some questions unanswered. Entitled "Police Accuse Woman After Long Grilling," we read about Mrs. Mamie Diller, 34, wife of Herman Diller. Mrs. Diller was arrested and charged with homicide. "The widow, whose husband was found beaten to death with a hammer yesterday in their apartment at 580 Empire Boulevard, had been grilled by detectives for twenty-four hours, but steadfastly maintained her innocence of the murder," the paper reported. Mrs. Diller was variously described as "dark and plump" and "drab and pudgy." Poor dead Mr. Dillard was a "wealthy pharmacist." The assistant D.A. ordered her arrested. She was fingerprinted, photographed and "placed in a cell in Empire Boulevard station." A certain Miss Hanna Bershon, "self-confessed sweetheart of Diller" was released by police that afternoon. She had told police that Diller "lived in fear of his wife, that he planned a divorce and that she and Diller were going to California after the divorce." 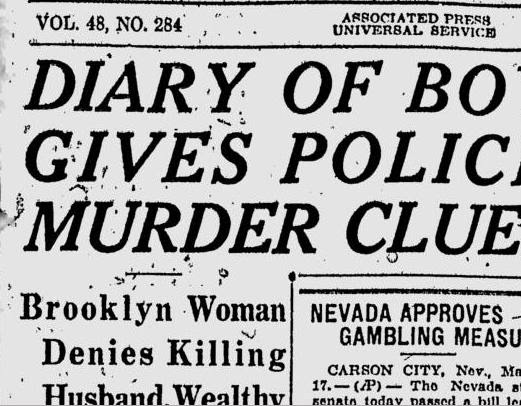 Police thought that Mrs. Diller killed her husband in a fit of jealousy. Then they learned that Diller's nine year old son, Martin, kept a diary -- a single page of paper apparently torn from a notebook. The boy's one page diary was entitled "The Life of Martin Diller." All in capital letters, it was written with a pencil, and police said "it showed signs of having been edited by an older person." The diary described the ups and downs of his life (you can read the whole thing here) and ends with the words, "One day I heard my mother quarreling with my father. I did not know what was the matter. As soon as the fight was over and my father went to work, I asked my mother what was the matter. She said I should swear to tell no one." Exhausted by the police, Mamie "became physically sick and semi-hysterical." The police also questioned Miss Mary Freely, 20, of 1201 Union street, until recently a maid in the Diller home. The maid said the couple frequently quarreled over his lover. When the assistant D.A. searched the Diller home, they found a hammer handle and a claw-hammer under Mrs. Diller's bed. Both instruments showed traces of blood, but appeared to have been washed. Police admitted they knew the hammer and the handle were in the apartment, "but said they did not think they had been used in the murder as the wounds on Diller's head indicated a hatchet had been used." The police changed their minds eventually. 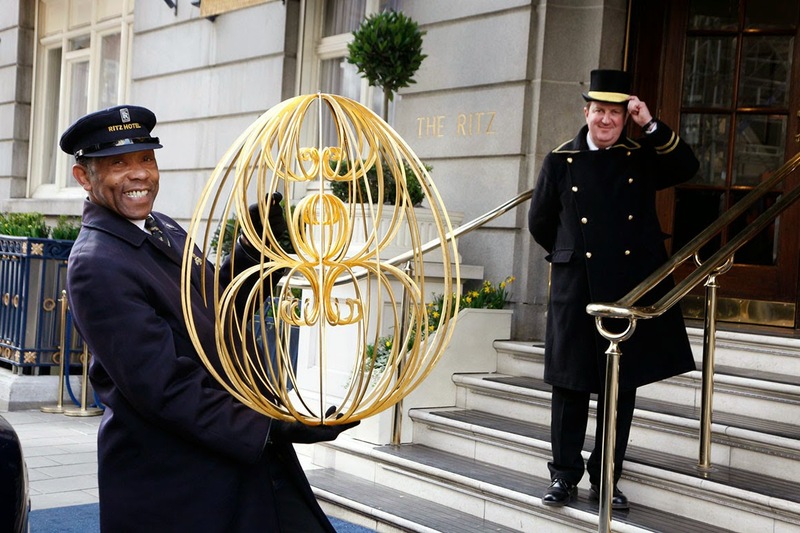 It was believed that Diller carried a large sum of money home with him over the weekend. But the motive of robbery was discarded with the discovery of jewelry and $60 in cash in the apartment. It was learned that Diller had been away from home both Saturday and Sunday night and that Mrs. Diller was upset over this. When questioned, the girlfriend, Miss Bershon, "repeatedly pointed an accusing finger at Mrs. Diller" and exclaimed: "She did it! She did it! She's threatened to kill us both. I know she did it!" The body had been found by Mrs. Diller lying on the floor between the two beds, with signs of a fierce struggle. Diller was described as "a powerful man weighing 225 pounds." Chairs were broken in the room, the bed completely disarranged and the mattress lay on the floor, stained with blood in many places." The index finger of his left hand had been badly cut. "Diller's pajamas were in shreds and he was scratched about the body, indicating the fierceness of the struggle." The next day, March 18, the Brooklyn Standard Union (as reprinted by Brooklyn Geneology) picks up the story again. The story is entitled, "Slain Druggist Buried as Wife Is Sent to Jail"
Mrs. Mamie Diller was held without bail while funeral services were being planned for her husband, over the protests of her attorney. She had been in policy custody for 48 hours without speaking to her lawyer. The elevator boy in the Diller apartment building said that Mrs. Diller did not leave her apartment until 9:40 A.M. Monday, the morning of the murder. Mrs. Diller told police that she left home shortly after 8:30 to visit her sister. The Brooklyn Eagle is sympathetic to Mrs. Diller, pointing out she worked 18 hours a day in her husband's drug store, ruining her health and her looks until she became the "drab, pudgy widow" now pacing in her cell. "Her aged mother at this time was heard to observe that she could not live much longer. In this, the woman now facing a charge of murdering the father of her children, is quoted by a cousin, Samuel Cohen, as saying: 'But you must live, mother. You know the doctor says I'll surely die If I have another child. That may happen any time, and I'd gladly die if I could bring another life into this world. But if that should occur you, mother, would have to take care of it, so you must make up your mind to live for a long time yet.' Strange words from the lips of one with murder in their heart." "A mysterious Madam X, the third woman" to enter the picture, was being sought by police after "she was named by Mrs. Diller" as one of the victim's former loves. Then police announced that they now believed that two persons had attacked Diller and killed him in his bed. "They pointed out that the hammer with which Diller was beaten to death was found under Mrs. Diller's bed and expressed the belief that it might have been put there by the slayer to help turn suspicion toward Mrs. Diller. Had Mrs. Diller used the hammer, they said, she hardly would have placed it under her own bed." "Her face heavily veiled and weeping hysterically, Mrs. Diller attended funeral services for her husband" after her lawyer obtained an order releasing her from jail for the services. When last we hear of Mrs. Diller, she was about to be arraigned in Homicide Court. We have no idea what happened at her trial, or if anyone was ever found guilty of the murder. If she had help, was it one of the girlfriends? The maid? Two other people entirely? But we think it may have worked out for Mrs. Mamie Diller. "Mamie Diller [named] as administratrix of the estate of Herman H. Diller." 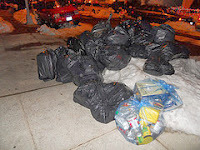 Another Embarrassing Lapse at Brooklyn Borough President's Office? The New York Post is reporting that not only did Eric Adams solicit donations from business leaders for a charity ("One Brooklyn") that doesn't exist -- but at the same meeting Rev. Valerie Oliver-Durrah, his top aid, tried to hawk the services of her private consulting firm. If the claims are true, the much-decorated Ms. Oliver-Durrah has no paperwork excuse to fall back on. "Valerie Oliver-Durrah has made a career of philanthropic advisement, non-profit management, life coaching and writing. As President and Chief Executive Officer of the Neighborhood Technical Assistance Clinic (NTAC), she utilizes a well-developed, executive skill set in support of organizations and leaders who seek to address the needs of underserved communities. " Tatoo artist "Mistah Metro," (aka "Orangatang Joe" aka Alex) who works out of Flastbush Ave. parlor Red Legged Devils, has attracted a shitstorm of criticism after posting a photo of his (unconscious) dog, Mel, on Instagram -- with a fresh tatoo on its shoulder. Mistah Metro bragged on Instagram, "One of the many reasons my dog is cooler than your[s]! She had her spleen removed today and the vet let me tattoo her while she was under." The reaction from the Entire World came fast and furious. "What the f***ing Hell is wrong with you? "was a fairly typical sentiment. Also, "that is Disgusting how could you do that to a poor dog"
As people started bad mouthing the tatoo parlor, the owner of Red Legged Devils tried to distance himself: “The dog didn’t get tattooed at this shop. It has nothing to do with this shop whatsoever." Mistah Metro is now officially a pariah in Brooklyn. @MistahMetro7 I hope I find you and I can murder you. 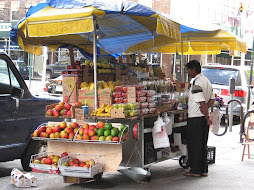 After hearing the presentations put on last night by Long Island College Hospital (LICH) supporters for potential bidders for the hospital, we wanted to buy LICH ourselves. Some of the positive reasons put forth to buy LICH included a ferociously dedicated staff; a storied history; the need for the hospital; loyal patients; and a top-flight medical program (before SUNY cratered it). A most persuasive argument was presented by Jeff Strabone, spokesperson for the Cobble Hill Association and, at the forum, speaking for six community groups. Strabone's description of a very wealthy Brownstone Brooklyn -- a demographic profile that reminded some of a nascent Upper East Side -- suddenly brought into high definition LICH's potential to be not just a successful hospital, but a very, very successful hospital. Add to that booming Gowanus, Red Hook, Downtown Brooklyn, DUMBO, and other expanding neighborhoods, and the shortage of hospital beds in Brooklyn -- and all of a sudden you're talking about a real money-making opportunity. The Brooklyn Eagle reported that new faces in the crowd of potential bidders included Toll Brother and Memorial Sloan Kettering. They also report that at least one of the previous bidders, Fortis, is mulling over increasing their health care offerings at LICH. A water line replacement job continues to keep cars off Henry Street in Cobble Hill, from Atlantic Avenue to Kane Street. According to the Cobble Hill Association, in order to safely replace it the water line, Natural Grid had to relocate an adjacent gas main currently too close to the water line for Department of Design and Construction to do the replacement work. This leads to concerns about the area's historic bluestone sidewalks, which National Grid is supposed to replace (but won't necessarily). According to the Department of Design and Construction, the project will "install distribution water main extensions for new buildings" and "replace existing extensions, valves and hydrants." According to DOD. the project is supposed to wrap up by March 24. The National Weather Service's Winter Storm Watch for Brooklyn, New York City, Long Island and the surrounding area for Monday has pretty much been called off. NOAA now is predicting 4 - 8 inches 3 - 6 inches maybe one inch, maybe two. IMPACTS...HAZARDOUS TRAVEL DUE TO REDUCED VISIBILITIES AND SNOW ACCUMULATIONS... ESPECIALLY DURING THE MONDAY MORNING COMMUTE. 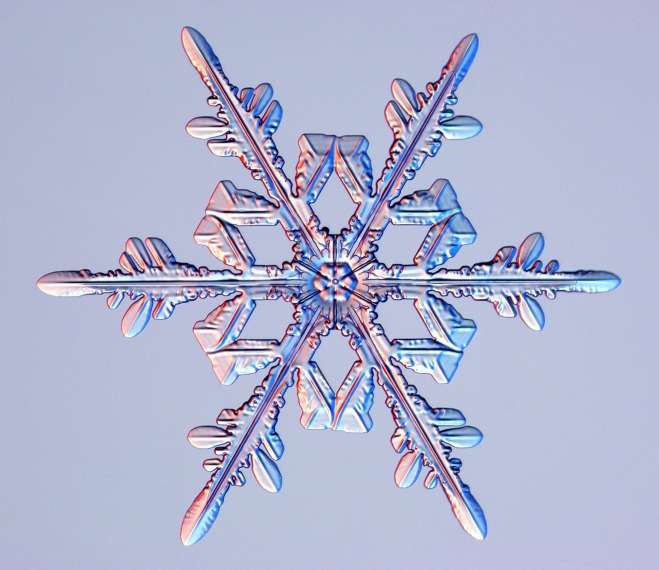 Rain could mix with the snow on Sunday between noon and 6 p.m., then it will turn to all snow. Travel will be hazardous; try to stay off the road if you can. NYC Sanitation Department has isssued a 'snow alert' for Sunday, 3/2, @ 11 a.m. "Salt spreaders and plows will be ready." Temperatures will be in the 20s and 30s teens and twenties. By comparison, on Friday, the coldest spot in the country was in Michigan's Upper Peninsula city of Newberry, where the mercury plunged to -41°F, according to Dr. Jeff Masters. What does Gov. Cuomo have against New York City? From public school kids, to Long Island College Hospital, to the mass transit system, the Governor seems to feel he can solve the state's budget problems by raiding the city's budget. State legislators, transit advocates and subway and bus riders rallied on Sunday to oppose what they called Governor Cuomo’s "proposed raid of $40 million from dedicated transit funds in the state budget." According to a press release from the Riders Alliance, in his proposed 2014-15 budget, Governor Cuomo requested to remove $40 million from a fund that is supposed to be dedicated to mass transit, and to move it to the General Debt Service Fund. Governor Cuomo wants to use the funds to pay debt service on the MTA’s Service Contract Bonds—bonds the State had committed to pay for, not the MTA, for the express purpose of alleviating the MTA’s debt burden and the negative impacts it has on service and on riders. 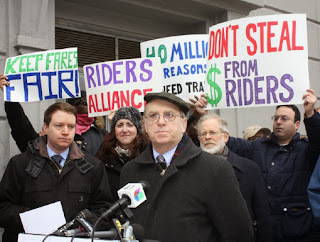 The advocates released a letter from more than 30 members of the State Assembly, led by Assembly Member Jim Brennan, opposing the Governor’s proposed raid and pushing for the funds be restored to the transit budget. The MTA has still not restored the level of service riders had before bus routes and subway lines were eliminated in 2010 cost-saving measures, and the Authority has predicted that there will be additional fare hikes in 2015 and 2017. State Assembly Member Karim Camara said, “I think everybody should consider how $40 million could be used to help riders in New York City. In Central Brooklyn, certainly some of this money could be used to alleviate overcrowding and delays on Utica Avenue, which is served by the B46, the second busiest bus line in New York City." State Senator Daniel Squadron said, “We've seen time and again that the best way to keep transit fares down and service quality up is dedicated funding. That's why we need to protect every dollar that is meant for transit -- and keep finding new ones. Because plastic green toy soldiers should be no more than three inches tall and should hold still, dammit. 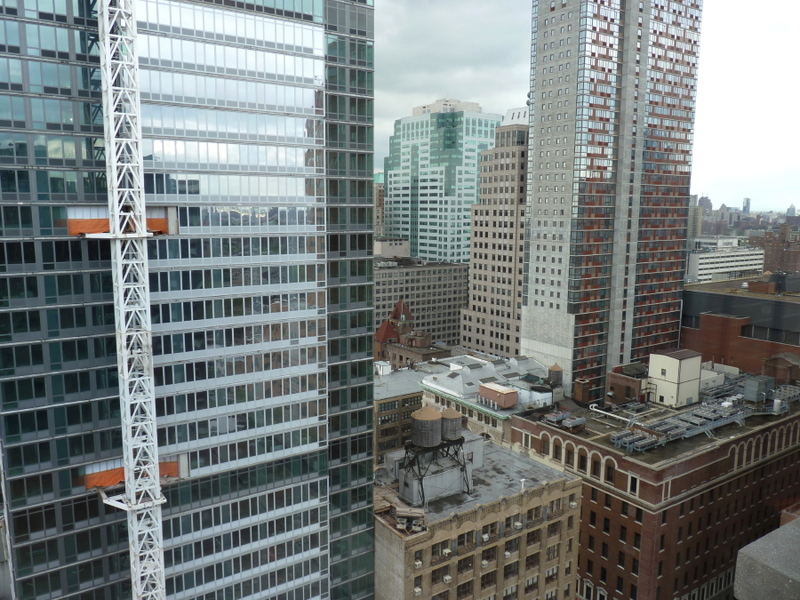 A staggering number of developments, both residential and commercial, are on the drawing board or in the beginning stages of construction in Downtown Brooklyn, Brooklyn Heights, Brooklyn Bridge Park, DUMBO, the waterfront, Gowanus and beyond. 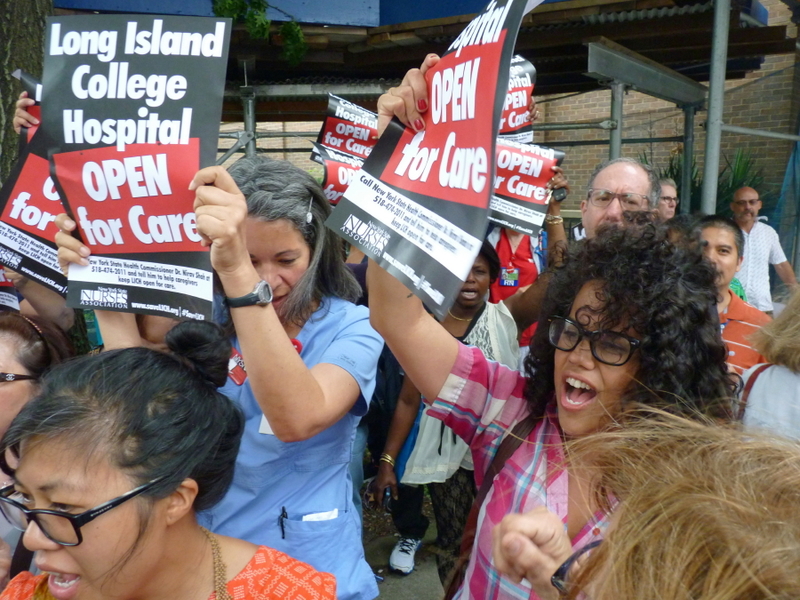 But hospital access in these areas is already stretched to the breaking point, with Long Island College Hospital's (LICH) service levels reduced by SUNY, and the next closest hospital, Brooklyn Hospital Center already clocking two-hour average waits in its ER. 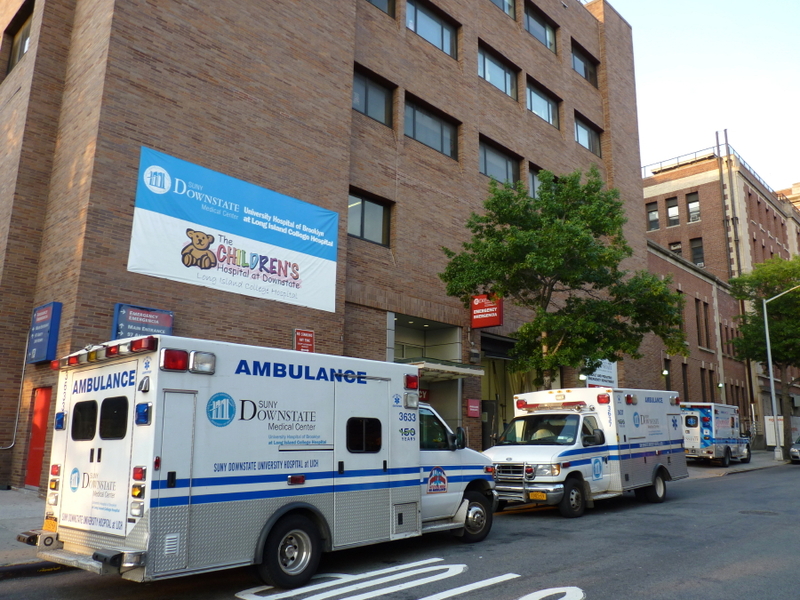 Further away, at New York Methodist, patients are spending nights in the hallways of the ER. More developments have just been announced that will bring thousands of workers to the area. The new owners of five former Watchtower buildings in DUMBO are getting ready to convert the towering properties into offices for techies, the Brooklyn Eagle reports. They will join employees at the new hotels and retail developments under construction in Brooklyn Bridge Park, the Brooklyn Tech Triangle, and Downtown, and the tens of thousands of new residents who will soon be moving into the towers springing up in Downtown Brooklyn (see this report by the Downtown Brooklyn Partnership), DUMBO, the waterfront and Brooklyn Heights. 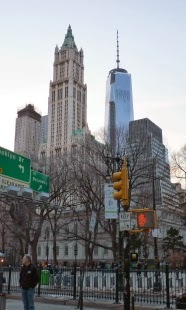 More thousands are expected as NYU expands its footprint utilizing its air rights at Metrotech, and CUNY does the same at City Tech. If LICH disappears, as developers are trying to make happen, those thousands will be forced to rely on Brooklyn Hospital Center, which cannot physically take care of them. Its location is also a problem. From DUMBO during rush hour it already takes more than a half hour to drive there. 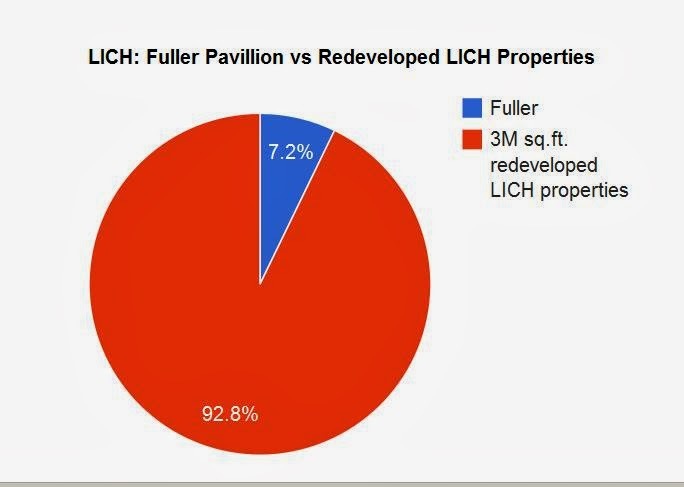 If developers are successful, another thousand units of housing will be built where LICH now stands. The thousand new units will have no hospital to serve them except, once again, Brooklyn Hospital. He told the Brooklyn Eagle, “When we realize that five or ten years from now, what do we do? It will cost us twelve times, twenty times more in terms of construction, so I think we’re at a health care crossroads, where creativity is needed and same old, same old isn’t going to cut it." Based on the current census data, Brooklyn has just two certified hospital beds for every 1,000 residents. Manhattan, by comparison, has five hospital beds for every 1,000 residents. Those figures don't include the recent developments. We need to be add more hospital capacity to northwestern Brooklyn right now, not subtract capacity. If we don't, the lack of critical health care infrastructure could cripple the economic boom that northwestern Brooklyn is experiencing, and leads to preventable tragedies. This kind of planning is the job of government, not developers. Only three Brooklyn reataurants are offering discounted lunches and dinners in this year's NYC Restaurant Week, which continues through March 7. 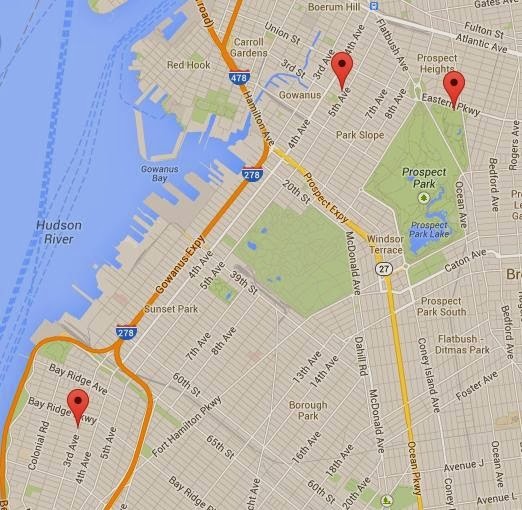 These are: Benchmark Restaurant in Park Slope, The Greenhouse Cafe in Bay Ridge, and Saul in Prospect Heights. A three course lunch will cost you $25; three course dinner is $38.